Preheat oven to 350 F (175 C). Place potatoes, garlic, and salt into a large pot, fill with enough water to cover, and bring to a boil. Reduce heat to medium, and simmer the potatoes until tender but not mushy, 8 to 10 minutes. With a slotted spoon, transfer about half the potatoes to a 9×13-inch baking dish. Pour half of the cream over the potatoes, season with black pepper and nutmeg, and sprinkle half of the Gruyere cheese onto the mixture. Top with the remaining potatoes; sprinkle again with black pepper and nutmeg. Pour on the remaining cream, and sprinkle with remaining Gruyere cheese. 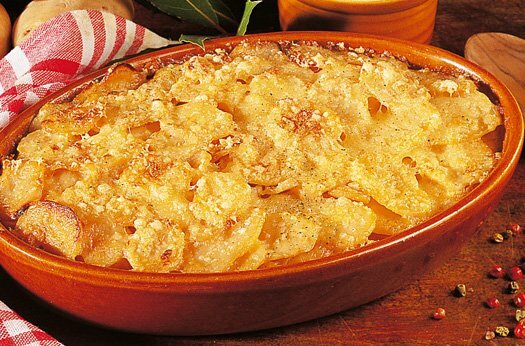 Bake in the preheated oven until the cheese topping is crisp and brown on top, about 1 hour.